Thank you to Mickleham and Westhumble Local History Group for allowing Dorking Museum to publish their research. Thank you to Jane Anthony from Dorking Museum for additional research. Percy Bodman was born in 1885 at 20, Union Street in the City of London the oldest of four children. 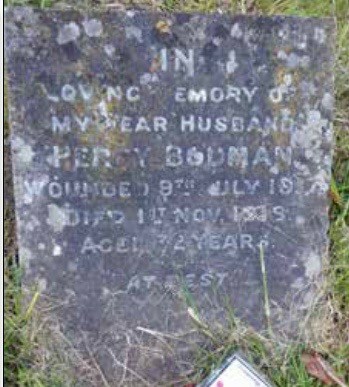 The son of a police sergeant, William James Bodman (1859-1919) who originated from Devizes, Wiltshire and his wife Alice Ann Ryle (1860-1944). The family lived in St Giles Cripplegate and then moved to King William Street. In 1901 he had already started working as a junior clerk for the Canadian Pacific Railway Company in London. In 1911 he was aged 26 and a boarder at a house in Lancaster Street, Kensington he was still working as a clerk for the CPRC. Records show that he travelled to Quebec, Canada at the age of 24, arriving 28th October 1910 but was back in the UK in early November 1910. It is likely that this trip was related to his job. His father had by this time retired from the police force. He married Daisy Amy Arthur (1884-1973) of Mickleham in 1913. Daisy was the daughter of Albert Arthur, landlord of The Railway Arms (now The Stepping Stones) in Westhumble. According to the 1901 census records for Mickleham, Daisy, aged 15, was living with her family in Mickleham and working as a dressmaker. Percy and Daisy had one child, Barbara (1916-2008). He was for some time organist and choirmaster at Frensham parish church, also deputy organist at Browning Hall and St Mary’s Church, Soho, London. Percy enlisted in The Royal Garrison Artillery on 8th Dec 1915 in London. He was attached to 233 Siege Battery and served for 1 year and 175 days. He was gassed during operations at Nieuwpoort, West Vlaanderen, Belgium on 29th July, 1917, and as a result was invalided back to England where he served 260 days with the Army Reserve and was finally discharged being ‘no longer physically fit for war service’ on 15th February 1918. 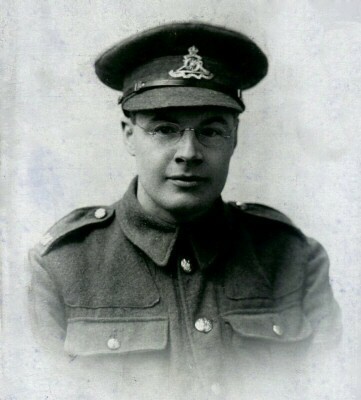 After discharge from the army, Percy was treated at a chest hospital in Carshalton. Later he, his wife and baby daughter moved to the Railway Arms, because he felt that he would recover more quickly and benefit from the cleaner air at Westhumble. He died at the Railway Arms on 1st November 1918. 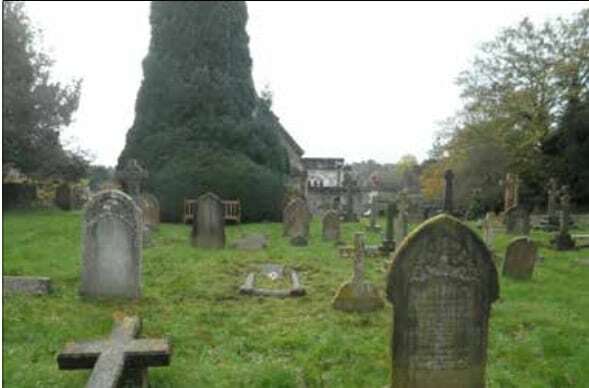 Percy is buried in Mickleham churchyard. Because he had been invalided out of the army before his death on 1st November 1918, he was not recognised as a war casualty. For more than four years Percy’s granddaughter, Lesley Wood, worked relentlessly to put this right. On 5th January 2015 she received confirmation of Percy’s status as a Commonwealth war casualty. After ninety-six years his last resting place has been designated as a Commonwealth War Grave. Dorking Museum is very grateful to the following members of Mickleham and Westhumble Local History Society for their research on the WW1 project; Paul Brown; Roger Davis; Caroline Freuler; Judy Kinloch; Judith Long; Phil Randles; Veronica Randles; Sue Tatham and Fiona Taylor. Thank you also to Ben Tatham and Andrew Tatham.